DVD Study Guide for use with God's Answers to Life's Difficult Questions DVD, a six-session video-based study for groups or individuals, by Rick Warren. Drawing from the examples of different biblical characters who faced the same issues, Warren offers concise, practical insights you can understand and apply in order to move past everyday struggles and experience a life of purpose, peace, and significance. 3. How Can I Be Confident in a Crisis? 5. How Can I Overcome Loneliness? 6. How Can I Ever Change? 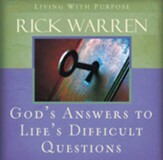 In this six-session small group Bible study (DVD/digital video sold separately), Rick Warren helps you find the simple, straightforward answers in ancient Scripture that lead to purpose, peace and joy&hellip; starting today. 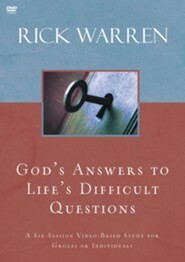 Drawing from the examples of bible characters who faced many of the same issues we face today  stress, failure, crisis, loneliness, and change  Warren offers concise, practical insights you can understand and apply in order to move past ordinary struggles to experience a life of extraordinary peace and significance. Lifes difficult questions do have answers&hellip; answers from the Bible that can change your life. As founding pastor of Saddleback Church with his wife, Kay, Dr. Rick Warren leads a 30,000-member congregation in California with campuses in major cities around the world. As an author, his book The Purpose Driven Life has been called the bestselling non-fiction hardback in publishing history by Publishers Weekly, having sold more than 33 million copies. As a theologian, he has lectured at Oxford, Cambridge, Harvard, University of Judaism, and dozens of universities and seminaries. As a global strategist he advises world leaders and has spoken to the United Nations, US Congress, Davos Economic Forum, TED, Aspen Institute, and numerous parliaments. Rick has also founded the Global PEACE Plan, which Plants churches of reconciliation, Equips leaders, Assists the poor, Cares for the sick, and Educates the next generation in 196 countries. 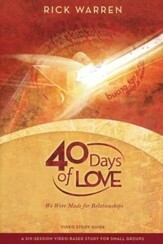 You can listen to Pastor Ricks Daily Hope, his daily 25-minute audio teaching, or sign up for his free daily devotionals at PastorRick.com. 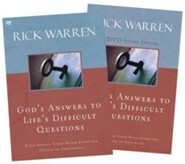 I'm the author/artist and I want to review God's Answers to Life's Difficult Questions, Study Guide.